Amanda's favorite meal is eggplant parm but hates mushrooms and corn? Ever wonder what your favorite characters from books would eat? Check it out! They say the way to a man’s heart is through his stomach. If so, then you’ll need a copy of EAT, READ, LOVE! This unique literary cookbook pairs recipes with excerpts from the romance novels that inspired them. 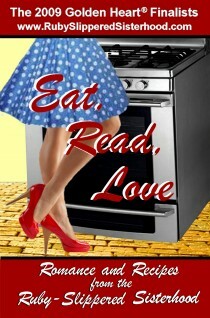 From YA to suspense to historical to contemporary… Join the members of the Ruby-Slippered Sisterhood for some “romancing the stove,” and delight in romance and recipes from some of today’s hottest rising stars, such as Darynda Jones, Jeannie Lin, Hope Ramsay, Laurie Kellogg, Kim Law, Amanda Brice, Liz Talley, and more! Because there’s no place like the kitchen!